I adore this outfit! I need to make a trip to Zara ASAP haha. Amazing set, pure colors, great shapes - I love it! I love your blazer! Great outfit! I love your blazer! You look great! I really love the black & white picture!!! Wow! that's the first time I see you without glasses!Love your outfit!Amazing trausers! Yes this is a great working outfit - stylish without being too over the top! Ahh! I saw this blazer at Zara last weekend and fell in love. Now I HAVE to get it! You're rocking this look! I love stripes, great style! The heels reminded me of Chanel cap-toe, Zara? Amazing find! By the way, who is your photographer? Muy guapa!! me gusta mucho el look y el color de la camisa por debajo queda genial! el blazer chulisimo y original! Once more a very nice post!! I don't know if I told you(I am sure I did), I am a BIG fan of stripes, so your look for me is a 100% GREAT!!!! love that blazer and I still die a little inside every time I see those shoes!! i've been looking for the perfect striped blazor...and i found it! you are rocking it girl. Love your outfit !! The blazer is amazing ! 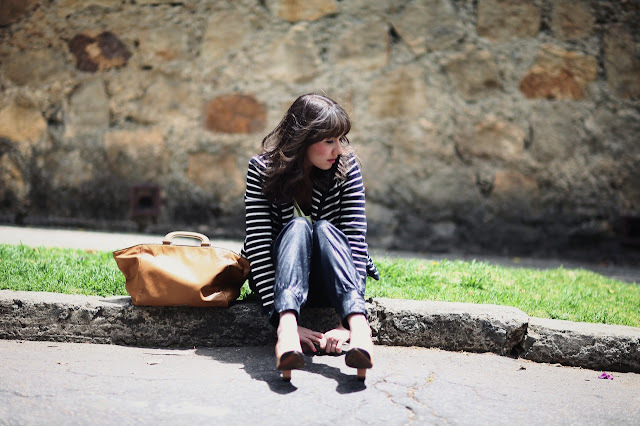 Your Blog is amazing, and your outfits are the best! i like it so much! kisses from Lima! I love the look, very nice jacket. y el bolso es increible :) me encanta!! Un outfit divino, pero niña, no te asas con los pantalones de cuero?? Yo he tratado de ponerme los shorts, y me asfixio....pero son divinos, me encanta el contraste del cuero con el tejido de algodón, y el bolso BB es divino!!!! Beautiful smile! Those pants are great! Thank u so much for all your comments! Shervin Nassi: thank u so much for your lovely comment, it makes me feel so happy! pero que chica de trabajo tan chic! Juli como siempre muy bella, tu blazar una preciosidad! Saluditos! Just a perfect outfit for work... loved it!! Love the jacket and the shoes! I'm loving your style. Hola guapa!!!!! Me encanta tu blog!!! Gracias por el comentario en el mio y en cuanto a tu propuesta, claro que acepto, de hecho, te sigo desde este momento!!!! Te espero por mi blog!!! What a cute smile ! Oh and I love the jacket, the bag and the shoes ! Hola !!! a mi también me ha encantado tu blog y tu estilazo, no lo concocía pero me gustado mucho, de verdad. Además no se porque te mesinto muy identificada con tu look y tu estilo. Por supuesto que nos seguimos !!! Love this outfit, you look amazing!!Kisses! Ta tendo sorteio de um curlformes participa? Sweet face!You look great!Love the pics! 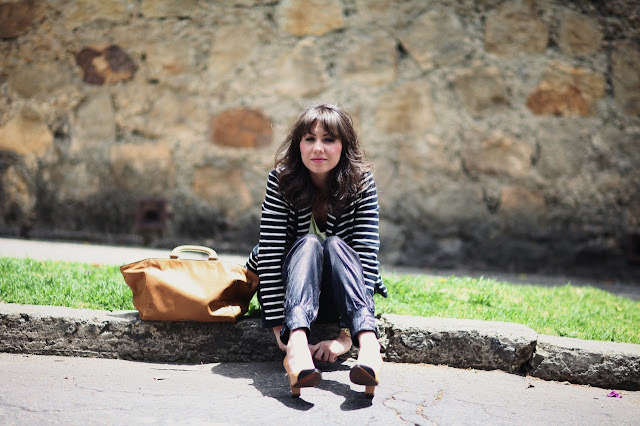 Loving your blog and your style! 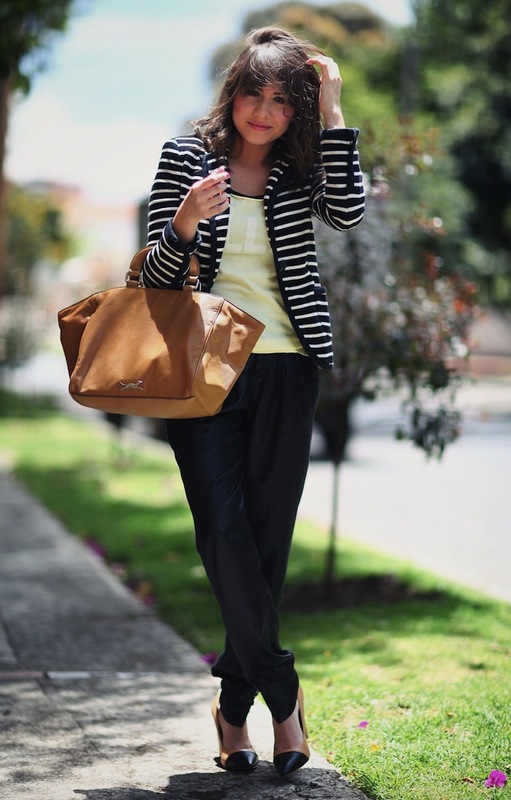 Stripes are definitely the way to go this season! Love the look!! Adoro el conjunto entero, realmente increíble. You look awesome! Such a fabulous outfit! Love your shoes and how you combined it with this ensemble :) love your blog girl! bueno... un look magnifico ! me encanta! te sigo desde ya tienes un estilo perfecto! k wapa! me encantan los pantalones! Thank u so much for your lovely comments! btw, you look stunning in that chic outfit! I really like the stripy jacket and how you matched the black and beige colours of this outfit, very casual chic. Thanks on your marvelous posting! I truly enjoyed reading it, you might be a great author.I will make certain to bookmark your blog and will eventually come back later in life. I want to encourage one to continue your great work. oh wow, great pictures and great outfit!! Me encanta este conjunto. Y los zapatos son geniales. Les sacas mucho partido. PD- No se por qué motivo pero no puede hacerme seguidora tuya. Pero a pesar de internet, te sigo! Hola...las rayas combinan con vos!! una maravilla! !